The 223 Remington has been around for over half a century, providing militaries, law enforcement agencies, and civilians all over the world with a lightweight, low recoil rifle cartridge. Great for hunting, plinking, and target shooting, the 223 Rem is a versatile round proven by shooters and hunters worldwide. 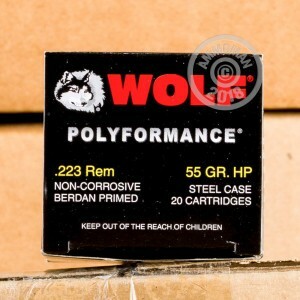 Wolf manufactures accurate, affordable, and non-corrosive ammunition. 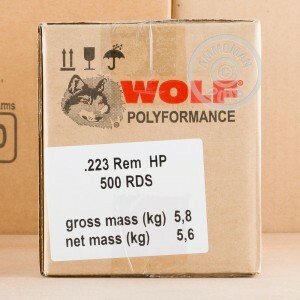 The Polyformance line of ammo features Wolf's special polymer coated steel casings for sure function and an affordable price tag. 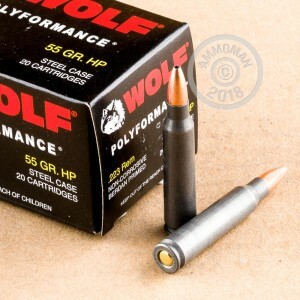 Each round in this box of 20 features a 55 grain hollow point projectile that is loaded into a berdan primed steel casing.